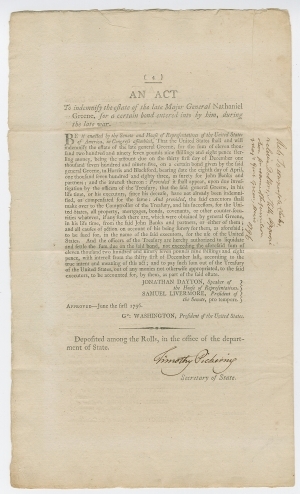 An Act Making an appropriation to satisfy certain demands attending the late insurrection; and to increase the compensation to jurors and witnesses in the courts of the United States, June 1, 1796; and An Act To indemnify the estate of the late Major General Nathanael Greene, for a certain bond entered into by him, during the late war, June 1, 1796. This “Whiskey Tax,” passed on March 3, 1791, immediately stoked anger, especially on the frontier: whiskey was the most efficient way for Western farmers to process harvests into an easily transportable commodity. Whiskey was even used as a currency. The tax hit small producers hardest. 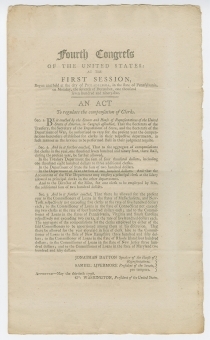 Congress revised the act on May 8, 1792. At Hamilton’s suggestion, they reduced but did not eliminate the duties and regulations. Public outcry thus continued, and on September 15, 1792, President Washington issued a proclamation condemning those who obstructed the law. The impact of the Excise Act took several years to take full effect, however, as federal collectors were repeatedly attacked and forced—often under threat of mob violence—to resign from their positions. Unrest came to a head after subpoenas were issued in early 1794 for violators of the Excise Act, who had no intention of appearing in court. Violent opposition erupted in Westmoreland County, Pennsylvania, in July 1794. U.S. marshals attempting to serve court papers were met by armed citizens and local militia members. Protests included tarring and feathering tax collectors, the destruction of government offices, the destruction of the houses of tax collectors, and the mustering of insurgent forces. Invoking the 1792 Militia Act, on August 7, 1794, Washington issued a proclamation ordering the rebels to return peaceably to their homes. He sent peace commissioners to negotiate and simultaneously began raising troops to suppress the insurrection. After the federalized militia, led by Washington and Hamilton, entered the insurgent counties and arrested several local men as examples (most of the leaders of the rebellion had fled west before the militia arrived), the opposition quickly fizzled. Suppressing the rebellion represented the first real test against internal threats for the newly created Constitutional government. Militia companies west of the Alleghenies had provided training and an organization structure for the leaders of the rebellion, and federal officials initially feared that Pennsylvania’s militia would sympathize with the rebellion and refuse to fight. But many militia members from eastern and central Pennsylvania proved eager to suppress the rebellion, believing the scale of the disorder threatened their own liberty and security. Washington issued a general pardon for all participants in the Whiskey Rebellion except the few still under indictment. The federal court found only two men guilty of treason and sentenced them to death by hanging. In July 1795, Washington pardoned both of the convicted rebels, as well as most of those who had yet to stand trial. In the end, the president was able to uphold federal authority with minimal bloodshed and with overall public approval. Congress repealed the hated “Whiskey Tax” in 1797. Two of the acts presented here stem directly from the Whiskey Rebellion. The first provided relief to distillers who could not work their stills due to the destruction or failure of fruit and grain by allowing them to pay a much lower tax on their stills. The second appropriated $20,000 to cover court expenses for the trials of those involved in the Whiskey Rebellion. Another act allowed prisoners who owned less than $30 in property to be released from prison for debt, so they could earn money to repay the debt. 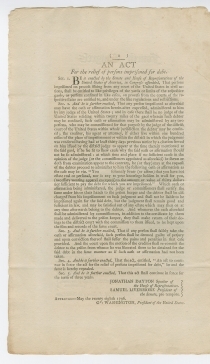 This act was an early effort to keep prisons from being overcrowded with debtors. 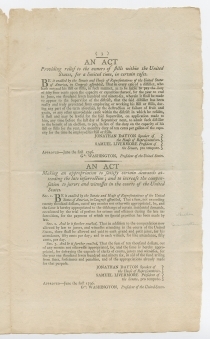 In the wake of the financial collapse of the 1790s and especially the Panic of 1796-1797, many individuals were imprisoned for debt, including several formerly wealthy people like financier of the Revolution Robert Morris and Declaration-signer and Associate Justice of the U.S. Supreme Court James Wilson. Revolutionary War hero Major General Nathanael Greene’s untimely death at the age of 43 in 1786 left his estate in considerable confusion. Although South Carolina, Georgia, and Rhode Island all rewarded Greene’s military service with land grants, he had accumulated substantial debts during the war. This act indemnified Greene’s estate for £11,297.9s.8d for a bond Greene had given during the war, perhaps for supplies for his troops. The other act permitted the Secretary of the Treasury, the Secretary of State, and the Secretary of War to raise the salaries of some of their clerks and to employ additional clerks. It also set the salaries for clerks to the commissioners of loans in the various states. Timothy Pickering (1745-1829) was born in Massachusetts and graduated from Harvard College in 1763. Admitted to the bar in 1768, he became register of deeds in Essex County. He represented Salem in the Massachusetts General Court and served as a justice in the County Court of Common Pleas. After leading a regiment early in the Revolutionary War, Pickering accepted George Washington’s offer to become adjutant general of the Continental Army in 1777. In 1780, the Continental Congress elected Pickering Quartermaster General in 1780. After the war, he tried several business ventures without much success. In 1787, he was a member of the Pennsylvania convention that ratified the U.S. Constitution. 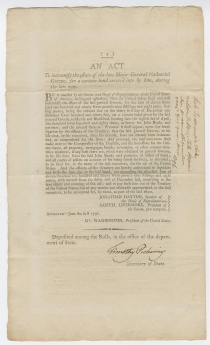 In 1791, President Washington appointed Pickering as Postmaster General, and he continued to serve in Washington’s cabinet and that of John Adams for the next nine years. He served as Postmaster General until 1795, then as Secretary of War for a brief time in 1795, and then as Secretary of State from 1795 to 1800. After Pickering objected to plans to make peace with France, President Adams dismissed him in May 1800. A passionate Federalist, Pickering represented Massachusetts in the U.S. Senate from 1803 to 1811 and in the U.S. House of Representatives from 1813 to 1817. Charged with reading confidential documents in an open Senate session, Pickering was censured by the United States Senate in January 1811. After failing to win re-election in 1816, Pickering retired to his farm in Salem, Massachusetts. Excerpted from Hamilton’s January 1790 Report on Public Credit.